One of The New School Art Collection's rarely seen and most significant works, Roxy Paine's Dinner of the Dictators, 1993-1995, returns to campus after a yearlong loan to the Natura Naturans exhibition in Villa Panza, Varese, Italy. 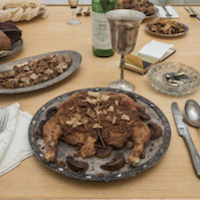 Dinner of the Dictators is a foundational work by the artist, and has informed other bodies of work, particularly his Specimen Cases and more recent Dioramas. Paine has often translated his fascination with systems of knowledge into hyper-real tableaux where fact and fiction/space and time converge and collapse. Acting as visual metaphors for greater social and cultural investigations, Paine’s works propose open-ended inquiries and offer numerous points of entry. Dinner assembles the favored meals of twelve historical figures the artist has classified as dictators - from Genghis Khan to Papa Doc Duvalier. Through the lens of food, power and politics, this exhibition expands Paine’s initial inquiry, asking The New School community to further consider the historic, economic and sociopolitical implications of food. The central response to Paine’s work is an ambitious installation, Corporate Vortex. Researched and designed by The New School faculty Chris London and Parsons Design and Urban Ecologies graduates Shibani Jadhav, Gamar Markarian and Silvia Xavier, the work focuses on the pervasive growth of three corporate giants, Nestlé, Coca Cola and Kellogg, and their control of three key crops: coffee, corn and sugar. It positions corporations within long range historical structuring of human social relations. Focusing on these three crops and the global expansion of these major transnational corporations, Corporate Vortex connects viewers to their unrelenting growth, visually problematizing their ubiquity in our daily lives by the abstraction of the vortex. Other contributions include: “A Dinner Conversation,” an imagined dialogue between dictators in the form of a recording by Eirik Jorgensen, Kaitlyn Lynes and Aly Mady, students in Nina Khrushcheva’s Media and Politics of Propaganda class; and a timeline of dictatorial regimes focusing on the subject of food as an economic and cultural driver. November 29, 6:00-8:00 p.m. Orozco Room, 66 West 12th St., 7th Fl. A discussion exploring the political implications of food production and consumption across the globe, with Paul Freedman, Chester D. Tripp Professor of History, Yale University and Nina Khrushcheva, Professor of International Affairs at The New School, moderated by Fabio Parasecoli, Director of Food Studies at The New School for Public Engagement. Film screening: La Grande Abbuffata (La Grande Bouffe, 1973) and talk: "The Dictators' Dessert"
December 5, 6:30 p.m., Anna-Maria and Stephen Kellen Auditorium, 66 Fifth Ave, Ground Fl. A screening of Marco Ferreri’s 1973 film La Grande Abbuffata (La Grande Bouffe), accompanied by "The Dictators' Dessert," a talk and Q&A with UC Berkeley postdoctoral fellow Ramsey McGlazer. In collaboration with Soyoung Yoon, Program Director of Visual Studies, Dept. of the Arts, Eugene Lang College of Liberal Arts at The New School. December 7th, 7:00 p.m. Kellen Auditorium, 66 Fifth Ave, Ground Fl. Parsons MFA Visiting Artists Lecture Series and The New School Art Collection hosts artist Roxy Paine in conversation with award-winning art critic and international curator, Christian Viveros-Fauné. Image: Roxy Paine, Dinner of the Dictators 1993-95, Stalin (1878-1953), detail, The New School Art Collection, (Photo: ©Sergio Tenderini). The galleries will be close at 3:00 p.m. on Wed, Nov 23 and remain closed through Sun, Nov 27 for the Thanksgiving holiday. We will be closed Sat, Dec 24 - Tues, Jan 3 for the winter holidays.